The following is a general guideline. 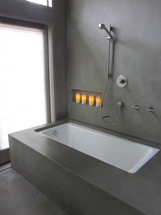 The beauty and art of hand crafting any shape or element with concrete is that the possibilities are endless. Endless shapes, endless colors, endless textures / surface finishes. Because every job we do is unique and customized (commissioned art) for our clients – every job is quoted individually. Having said that, in kitchens and baths – about 80% of the time we do a 1.75″ thick countertop – thicker is an up charge. At 1.75″ thick our current price range is $105 to $160 *per square foot, based on rectangular shapes, standard colors and calculated on the footprint of the countertop. (i.e. we don’t subtract for the sink area). For comparison, you can get good granite for about $50 per square foot. A typical kitchen is about 45 square feet. Doing the math: 45 x $105 = $4,725 to 45 x $160 = $7,200 Again – this is only an example and could change based on the customization of the commissioned art work. Please note that due to higher than normal insurance requirements, permits, and other unknown contractual factors inherent with commercial “Vendor” Agreements and “Contractor” Agreements – we reserve the right to quote on an individual bases each commercial job – this includes jobs for home builders. The stipulations within the commercial client’s vendor agreement and / or any other contractual agreements will determine the final price. Therefore, we request that all commercial clients submit their vendor agreements and insurance requirements – before we can estimate costs. $105 to $160 per square foot includes our standard colors (earth tones). Blues, Greens, Reds, Whites, and some other custom colors carry an upcharge – These are quoted based on the pigment amount and color used. ** Please note, we have a lot of experience with “white portland cement” All concrete will patina over time which cause little hairline cracks – not to be confused with larger structural cracks. We warrant against structural cracks, however hairline cracks are part of the beauty and patina of concrete. Having said all of that. White portland cement (versus standard gray portland cement) tends to develop more hairline cracks PLUS, it’s harder to keep clean. Our clients buy their own sinks and provide them to us prior to templating. We typically cast our countertops for an under mount sink – therefore, exposing and finishing the edge mass of the concrete around the sink. We charge $250 for a typical undermount sink. 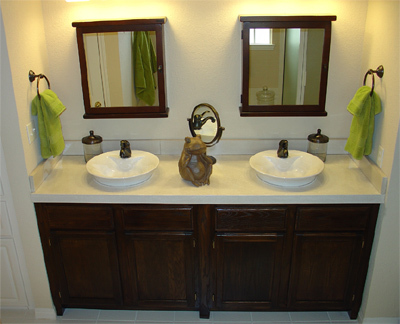 (farmhouse sinks and other highly customized sinks require an upcharge). The sink install price includes the sink knock out (including faucet knock outs) and sink install (attachment to the countertop), The sink install price does not include the price of the sink and does not include plumbing hook ups – we are not licensed plumbers. 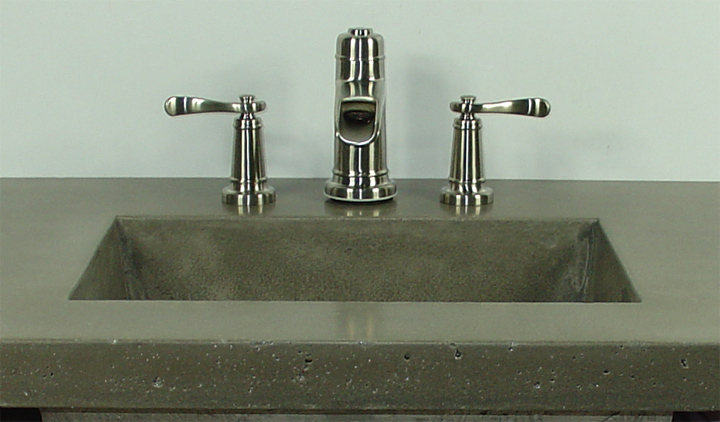 We charge $50 for overmount on typical sinks – Note: Sink area is not subtracted from the square footage for pricing. About 1/3 of the time we’ll do a concrete back splash as a separate piece – 1″ x 4″ at $30 per lineal foot. Integral back spalshes are more costly. $105 to $160 per square foot includes an “eased” edge, which is a soft 90 degree edge (about 3/16″ radius) Bullnose edges and other custom edges are per quote. Most designers agree, an eased edge lends itself to concrete better than bullnoses or other edge treatments typically found in the granite world. $105 to $160 per square foot includes our standard smooth-cast finish. Honing and/or grinding to expose aggregate requires an upcharge. *Acid Staining is also available at $15 to $50 per square foot upcharge. The site location, ease of access and protective requirements for surrounding areas determine the final price for acid staining. Pre-cast is done in our studio in sections no longer then 94″ long by 36″ wide. Please note: this means that we will need to be informed of where the seams will need to be located. We can cast-in-place larger pieces on-site which would be cast right side up and troweled finish, with minimal seams. Click Here for a brochure on our concrete countertop sealer. It’s Just Concrete – Why Isn’t it Cheaper than Granite? 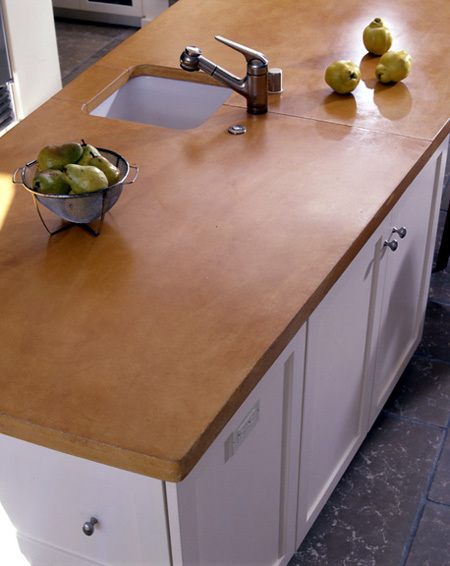 Folks, the bottom line is that our concrete countertops are about double the price of granite. So why would someone pay twice the price, when they can get perfectly good granite, mined by child labor and shipped half way around the world on diesel powered boats and trucks? I trained under Buddy Rhodes and he taught me early on that the concrete countertop client is looking for something unique. They are bored with the choices of granite, they want something unique and they like the environmental aspect of concrete. Nothing else will do – except concrete. We have found this to be so true over the years. In fact, I probably “un-sell” more clients than I sell. Actually, I do not try to “sell” anyone on concrete. In my opinion, even if I was successful at “up” selling someone on concrete, because it’s so unique, they probably will not be happy and could have been just fine with something at half the price. We want happy clients. We’re passionate about concrete and find that our best clients are passionate about it as well. We have seen concrete companies out there doing it cheaper – many are flatwork concrete companies, excited to get in on the action of concrete countertops. All we have to say is – check their work. After all – you don’t want to end up with an elevated sidewalk in your kitchen! We are proud of our art. Many installations are in public spaces – and we stand behind our work. If our prices fit your budget, we would be happy to come out and show you color samples, take measurements and give you a formal bid. You can also schedule an appointment to visit our East Austin art studio. *Note – Honing – Grinding and some colors (esp Blues, greens, reds, bone white, and other whites) incur and up charge – price per bid. The above prices include: sealed and installed on existing sub-structures – in the local Austin area – The above pricing also assumes a readily accessible area with electricity and water, and requires that the subsurface / cabinets are ready to place the concrete on. We can also bid to demo old countertops and construct substructures. 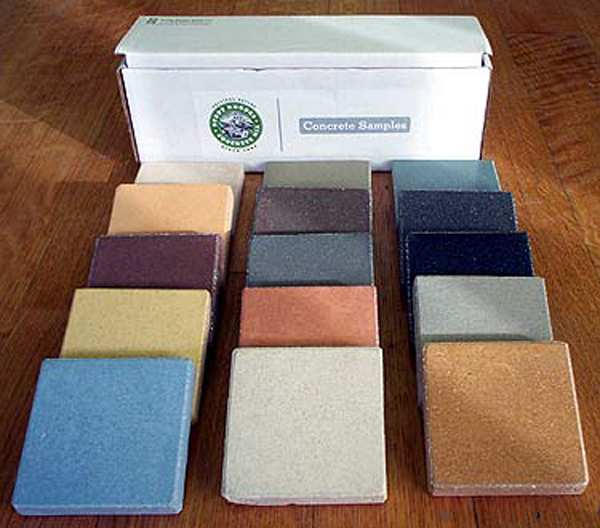 Please note: Color and texture will vary with this handmade concrete product, changing over time as it patinas. Hairline cracks (not to be confused with structural cracks) will also continue to develop over time. This aging process is what makes concrete so unique and a desirable feature for those who want it. *Warning , according to standard construction practices, concrete should never be exposed to high temperatures or flames, it can explode! At bare minimum, it will develop structural cracks. Care should be taken when engineering and designing fireplace surrounds and fire pits. We are not licensed engineers and cannot provide structural or construction advice. Generally, our work only comprises the placement of concrete elements onto existing structures. Therefore, all engineering and construction rest solely on those installers or designers. This customer wanted an apothecary look. We suggested the Buddy Rhodes Bone White color with a hard troweled finish. We designed and installed everything, including the medicine cabinets, lighting and towel fixtures. We also stained and modified two 36 inch “off the shelf”, red oak kitchen cabinets, making them reminiscent of the era. Tapered furniture legs were used instead of spacers to bridge the cabinets. Therefore, making it appear like a piece of furniture in which the 2” thick countertop was done cast in place. The customer also specified needing more storage space. So we used kitchen cabinets at 24” depth, and the taller height is actually proving to be more ergonomic for these average height customers. We are Artisans in the ancient art of sculpting & staining concrete. Providing custom decorative concrete projects in and around Austin, Texas & the Central Texas Hill Country. If you are longing for something solid, something that will last forever, concrete is your answer. 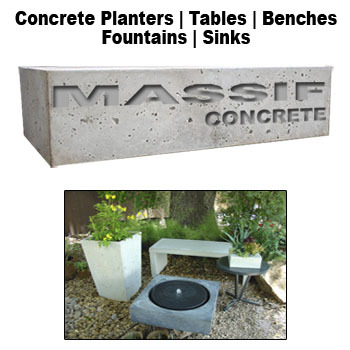 Concrete’s mass can not be duplicated by synthetic plastics, Marble in the same mass would be prohibitively expensive. If you like the distinctive and variegated nature of leather. If you want to have something unique, something with your own flare and custom built to match your decor and color scheme, concrete might be for you. Concrete is the “greenest” building material. If this is possible can you provide me a quote for that. It would be for a new restaurant in Lakeway and we would need them by the first week of October. Yes, we can inlay wood like that. Do you have the wood? Your schedule is really tight for concrete. Plus we have other jobs in queue. It’s a hurry up and wait game, with the curing process. We don’t see that you left an email address. Please call Larry at 512-921-5944. 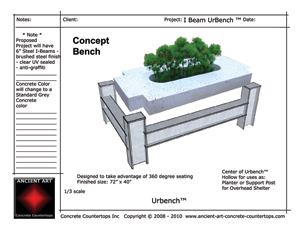 We are looking to do a 16″x104″ concrete breakfast bar in a new construction project. No cuts, just a big rectangle. I can arrange a site visit if you need to see the location. Looking for pricing on piece and delivery plus some advice for install. Austin Concrete Countertops Copyright © 2019. (By Appointment Only Please - We are Often Out on Location) 714 Shelby Ln STE G Austin, TX 78745 Phone: 512-537-0776 Ask for Bryan Please note: Color and texture will vary with this handmade concrete product, changing over time as it patinas. Hairline cracks (not to be confused with structural cracks) will also continue to develop over time. This aging process is what makes concrete so unique and a desirable feature for those who want it. *Warning , according to standard construction practices, concrete should never be exposed to high temperatures or flames, it can explode! At bare minimum, it will develop structural cracks. 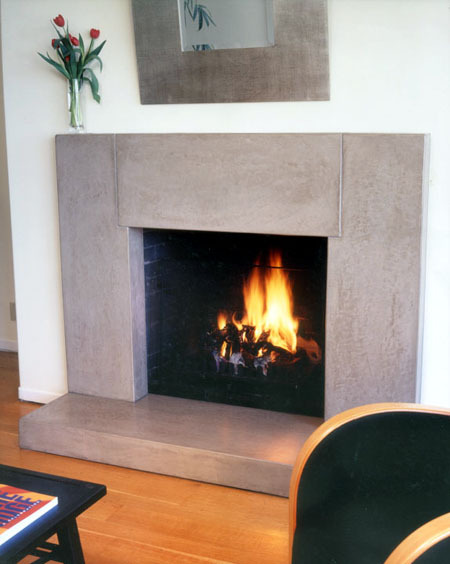 Care should be taken when engineering and designing fireplace surrounds and fire pits. We are not licensed engineers and cannot provide structural or construction advice. Generally, our work only comprises the placement of concrete elements onto existing structures. Therefore, all engineering and construction rest solely on those installers or designers.